This brief introduction covers the terms and concepts related to the Internet and the Web with which Web developers need to be familiar. For many students, some of this will be a review. Chapter 1 provides the base of knowledge on which the rest of the textbook is built. As HTML5 is introduced, examples and exercises encourage students to create sample pages and gain useful experience. Students are encouraged to create sample pages as they read through the text. 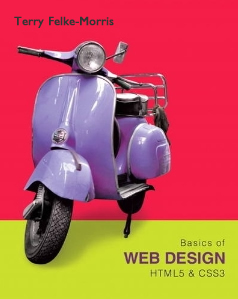 This chapter focuses on recommended web design practices. Page layout, color theory, navigation design, and best practices for text, graphics, and multimedia are introduced. The technique of using Cascading Style Sheets to configure the color and text on web pages is introduced. This chapter introduces configuring text and graphics on web pages. Topics including text size, weight and font typeface styling, types of images, image optimization, CSS borders, CSS image backgrounds, new CSS3 visual effects, and new HTML5 elements. Students are encouraged to create web pages as they read through the text. This chapter continues the study of CSS and introduces the box model and techniques for configuring margin, padding, and borders. In addition, CSS3 properties to configure rounded corners, box shadow, text shadow, opacity, and gradients are also featured. Centering page content with CSS is also practiced in this chapter. This chapter continues the study of CSS and introduces techniques for positioning and floating web page elements, including a two-column CSS page layout. New HTML5 semantic elements are also introduced. 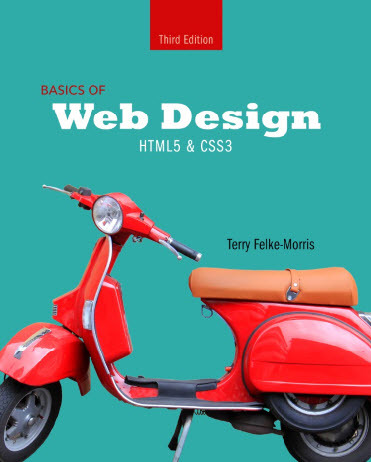 This chapter revisits earlier topics and introduces more advanced techniques related to hyperlinks, configuring CSS for print, and designing pages for the mobile web. CSS media queries are introduced as students configure a web page for both desktop and mobile display. This chapter focuses on the HTML elements used to create tables. Methods for configuring a table with CSS are introduced. This chapter focuses on the HTML elements used to create forms. Methods for confi guring the form with CSS are introduced. New HTML5 form control elements and attribute values are introduced. This chapter discusses how to register a domain name, choose a web host, and publish to the Web. Search enging submission, search engine optimization, accessiblity testing and usability testing are also introduced. Building on this textbook's successful first and second editions, the third edition introduces HTML5 structural elements early (in Chapter 2) and provides more emphasis on the use of color in web pages (Chapter 5). Contact your Pearson Higher Ed Addison-Wesley representative or visit Pearson Higher Ed Addison-Wesley Publishing for access to an evaluation copy and for more information about the textbook. Get your free download of the 3rd Edition Student Files! Review flash card activities are available for each chapter on this website. Students can use these activities to review concepts and terms. Some instructors use these as group activities in the classroom. They also can be made available for independent student self-assessment activities.